Recently refurbished to offer a more relaxed and refreshing environment. 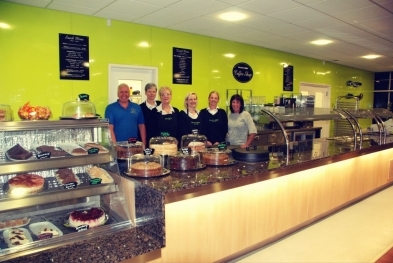 Offering delicious homemade meals, snacks and beverages catering for all ages and tastes in a relaxed environment with views over the Lyme Valley and Bet 365 Stadium. Breakfast is served from 9am (Sunday, 10am) until 11:30am. Hot and cold snacks are available throughout the day. Closing time for the Coffee Shop is 4:45pm (Sunday's 4:15pm). Our menu includes tasty snacks, jacket potatoes, freshly made sandwichs and paninis. With the sweet favourties, cakes, waffles and ice cream available throughout the day. We serve a range of freshly made breakfasts and lunchs, baked by our staff. 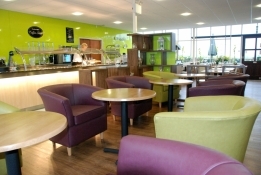 Drop in for a coffee or a meal in our relaxed coffee shop.